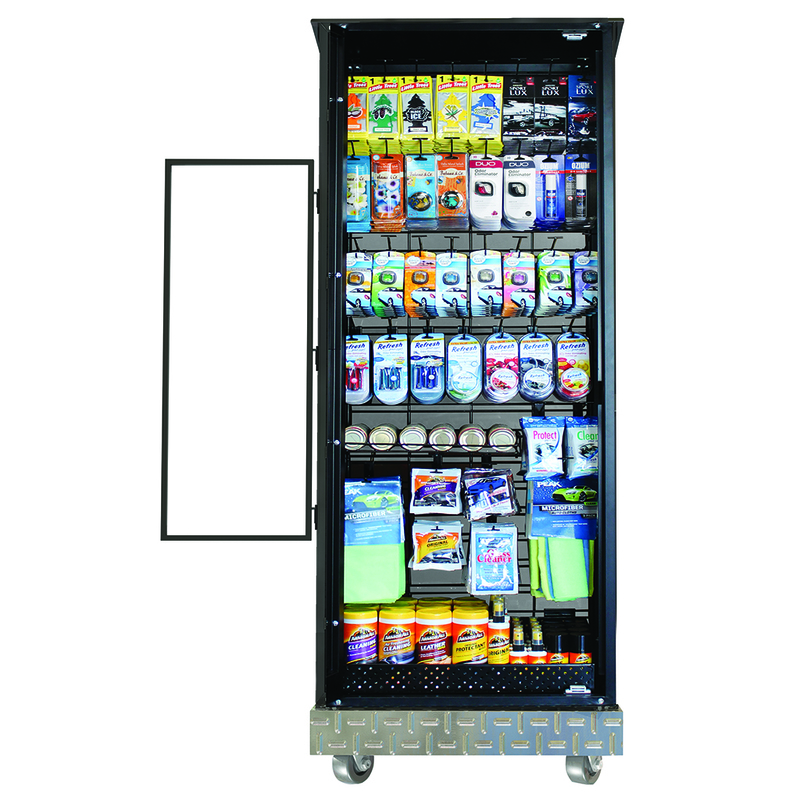 The Express Store Display is made of powder coated steel and wrapped with UV protected Plexiglas. The clear door is hinged and held closed with magnetic strips. A 2’x 6’ grid panel is mounted inside for merchandise display. The display includes 50 each 10” grid hooks for hanging products along with a solid basket for shelf products. The wire racks for canister and spray air fresheners as seen in the photo are ordered along with the products for that particular wire rack. 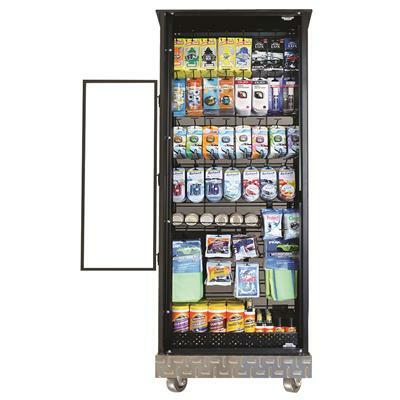 The display features heavy duty locking casters that are accessible through a movable plate on the floor of the display. Handles are mounted on each side of the display for convenient moving and lifting. HOW IS THE EXPRESS STORE USED? Employees roll the display out to the drive-up entrance to sit by the service writer or next to the Kiosk. When customers drive up to order a car wash they are invited to purchase retail products at the same time. The service writer collects for the products they choose along with their car wash and gives the customer the product from the display. At the end of the day the display can be easily rolled back into the car wash building and be locked away. This is a great opportunity for the wash to increase their “per car” revenue. The display protects the products in wet weather, but can easily be rolled away if conditions become severe. Depending on traffic at the wash the operator has the flexibility to either use the display on a given day or keep it put away. Many Express Car Washes have vending machines by the vacuums which they can continue to employ; however they are generally only vending 6-8 items while the Express Store allows an operator to sell 50-60 items with higher retail prices and greater profits.